ELMONT, NY—Emitting an ear-piercing squeal while surveying the blood-soaked hay in the stable, American thoroughbred racehorse Justify woke up Monday next to the decapitated head of his prized jockey Monday after refusing to throw the Triple Crown. 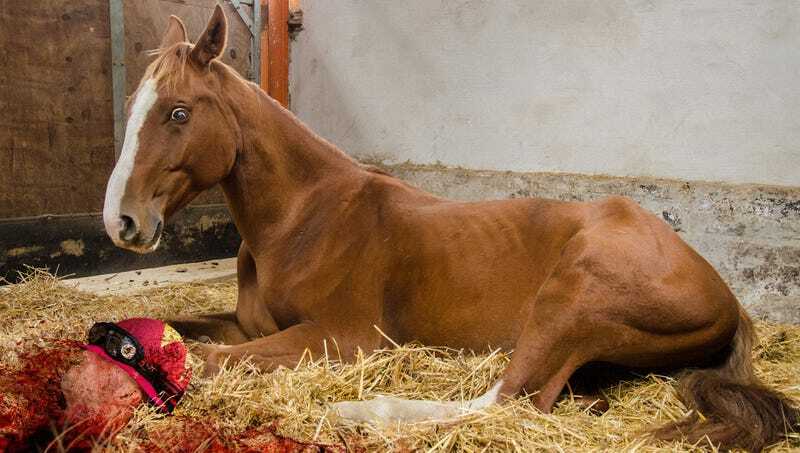 According to sources, the dazed colt, which had won the Belmont Stakes just two days earlier, realized the mafia had made good on their threats after noticing the severed head of Mike Smith, his most beloved jockey, beneath the blanket of hay. Reports confirmed that the racehorse stared into the glassy, lifeless eyes of his rider as the helmeted head rolled out into the open, causing the stallion to whiny and rear up in horror. At press time, Justify busted through his gate and bolted out of the stable, worried that someone was coming to break his hooves.